Resolutions are the laughing-stock of the goal setting community. No one adheres to resolutions. That’s why this year I’m resolving to write fifty-two blog entries – one each week. Resolve is defined on dictionary.com as “to come to a definite or earnest decision about; determine (to do something)”. I believe in resolving all the time. I constantly set goals, but I do recognize that the end of a year and the beginning of a new is a great mile marker for past goals and an opportunity to set new ones. I’m writing a blog a week to improve my writing skills. I’ve set a long term goal envisioning myself as a part-time writer and eventually writing a book. I read a good one this week titled Talent is Overrated. The premise of the book is that while most people think people are great at a skill due to either (1) talent or (2) hard work, neither is the source of greatness. Excellence comes from deliberate focused practice and this is hard work. Running a marathon slowly is hard work too, but it won’t make you great at something. You have to clearly define what your “learning zone” is. This is the range between not challenging yourself at all and attempting challenges so difficult that you become easily discouraged. The “learning zone” stretches you just enough, so you’re continuously learning and while this is hard, it isn’t so hard that you think it’s a waste of time. 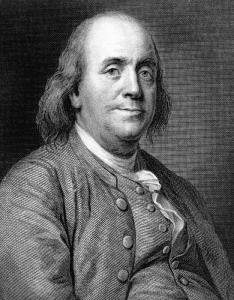 Benjamin Franklin, whose writing was critiqued by his father during his teenage years. Franklin’s father said that his writing was deficient “in elegance of expression, in method and in perspicuity”. For those like I lacking the offhand definition of perspicuity, it’s a noun meaning “clearness or lucidity”. When confronted with such a critique, most teenagers would absentmindedly shrug their shoulders. Not Franklin. Franklin found a great English periodical, The Spectator, and dove in fully engaged. He took notes on the writing. He rewrote the passages in his own writing. He compared his work with the original. Not only that, but he took to writing the essays in verse and developed games for improving his organization. The book relates short biographies from Tiger Woods, Warren Buffet, and several others who used similar principles of focused, deliberate practice to develop great skills. Different skill sets require varying amounts of practice time to develop excellence, but research generally states that five to ten years are needed and ten thousand hours of practice time. Everyone from Mozart to the Beatles needed a deliberate focus and copious practice time to become great at their skills. Like Franklin I want to improve my writing. My first step is getting more practice, (i.e. this blog). Step two is reviewing my work to analyze areas for improvement. If I hit a dead end there, I’ll consider a method closer to Franklin’s. The wild card in my back pocket is leveraging my wife, who writes much gooder than I do and may be the one person interested in what I have to write. In all journeys towards excellence, a teacher is invaluable. With or without your teacher, listen to those wise sages, who’ve come before us and our eyes will be forever uncovered. What greatness are you envisioning for your future self?